Here’s another great game from the students of the DigiPen Institute of Technology. A Flipping Good Time is a free action platform game with some puzzle elements, created with great polish and high definition graphics. The game offers smooth scrolling with various parallax layers and a cool gimmick – the ability to control gravity. 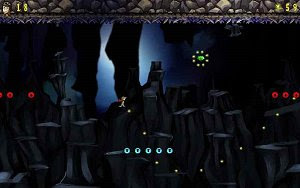 The main character is the only one capable of affecting gravity to solve levels and travel upside down when necessary, and it will happen frequently during the 14 levels that compose the game. There are also some exciting kart rides along the way. A Flipping Good Time is a fast-paced and ingenious 2D platformer that will test your reflexes but also your wits.